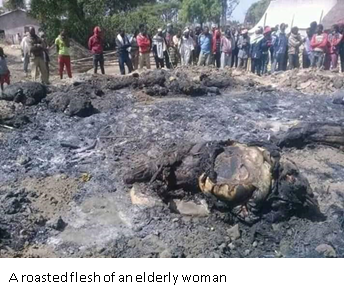 (OSGA Statement ,15th April 2019) It is sorrowful and distressing for the Oromia Support Group Australia (OSGA) to hear the deliberate action of poisoning the Oromo ex-freedom fighters in the Xolay military camp, Oromia Region, on Sunday, the 14th April 2019. Based on information obtained from the OSGA informants, and at the time of this statement is produced, more than hundred and twenty, (120), people are in a critical condition without proper and insufficient medical care, and fighting for their lives. The well planned and targeted action of poisoning these innocent fellow citizens is not only a tragic for the families, colleagues and the entire Oromo nation and peace supporters, but it also contributes to reverse the peace initiatives yet claimed in the country. It is utterly reprehensible an act of murder. To that end, the Oromia Support Group Australia urges the Ethiopian Government to take essential steps to disclose the outcome of the investigation publicly and ensure that operations dealing with members of the ex-Oromo Freedom Fighters comply with the international human rights and humanitarian law. (A4O, Finfinnee, 19 April 2019) Advocacy for Oromia, a non-profit advocacy organisation working to ensure that the Oromo people’s rights and wishes are respected, is highly concerned at the intimidation, the violence and the wave of arrests that have taken place during the week end in Oromia. We are writing this letter to draw attention to gross and disturbing human rights violation in Gujii area, Oromia Regional state where Ethiopian military, regional and zonal administrations are committing grave violation of human rights that include mass killing, incineration of human being, mass detention, burning of villages, confiscation of properties, torture and starvation of villagers in the name of stamping out OLF (Oromo Liberation Front) army from the area. Hence, on behalf of Guji people who have endured such brutality thus far we hereby beseech all concerned body to heed these grave human rights violation and immediately; call for the cessation of these brutal collective punishment, release all the bread winners of their family from concentration camps, work to restore peace in the area through civilized negotiation with OLF instead of resolving the differences through military means and finally bring those who have committed grave crimes to justice. 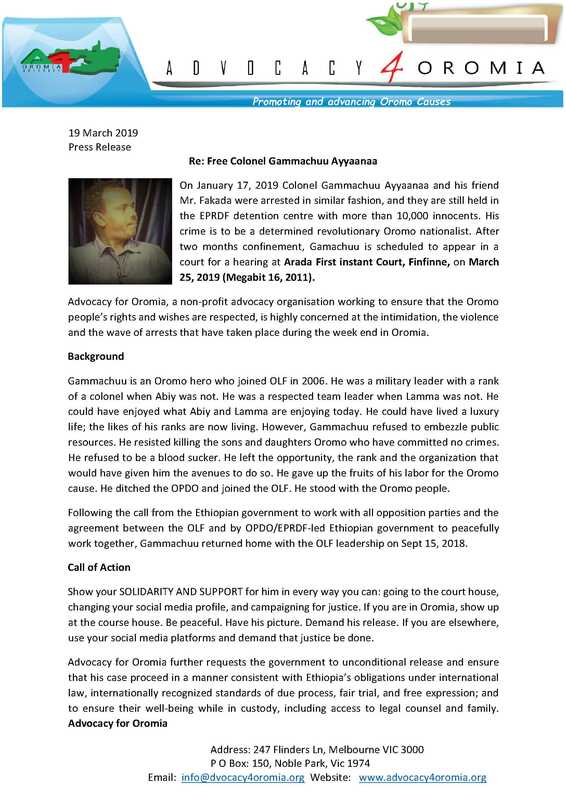 (A4O, Press Release 19 March 2019) Advocacy for Oromia, a non-profit advocacy organisation working to ensure that the Oromo people’s rights and wishes are respected, requests SOLIDARITY AND SUPPORT for Colonel Gammachuu Ayyaanaa in every way you can: going to the court house, changing your social media profile, campaigning for justice, and doing everything that is orderly and peaceful. The organisation says in today’s press release, more than 10,000 Oromo individuals are imprisoned because of their bold stand against in justice in Oromia. Event: Gamachuu is scheduled to appear in a court for a hearing. Show your SOLIDARITY AND SUPPORT for him in every way you can: going to the court house, changing your social media profile, campaigning for justice, and doing everything that is orderly and peaceful. Where : Arada Court, Finfinne.